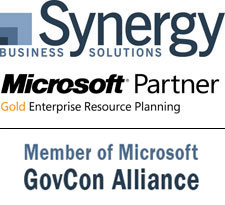 Synergy is one of a select group of Microsoft GovCon Alliance members. Synergy Business Solutions, a West Coast software solution provider specializing in project- and cloud-based accounting systems, announced today it has become a member of the new Microsoft GovCon Alliance. The Alliance is a cross-section of Microsoft Dynamics partners with expertise in meeting the unique system needs of government contractors. One goal of the Alliance is to enable government contractors to access solution providers that balance the government mandate for compliance to federal regulations with the business imperative for flexibility and agility. They can then implement a holistic business solution, deployed in the cloud or on-premise, that can meet both their commercial and government-contracting needs. Another purpose of the Alliance is to ensure that Microsoft clients that are in the federal market get the highest level of quality support. Microsoft only selected implementing and supporting Microsoft Dynamics partners for membership who have successfully engaged government contractors, have shown demonstrable growth, and are committed to ongoing investment in market-specific competencies. Since 2003, Synergy Business Solutions has provided project accounting, financial management, enterprise-class, and government-contractor solutions to mid-sized companies (from 50 to 2000 employees) through Microsoft Dynamics SL in Professional Services and make-to-order Manufacturing. Now with nearly 350 clients, Synergy has a team of consultants and system implementers that has been trained by certified instructors in Federal Acquisition Regulations (FAR), Cost Accounting Standards (CAS), and in the specific requirements of compliant accounting systems. Synergy also partners with Redstone Government Consulting to ensure their clients not only get a full-compliance system solution, but, when necessary, a full-compliance process solution as well. A Microsoft Gold Enterprise Partner, Synergy Business Solutions provides comprehensive software solutions primarily to companies doing project-based work in the private or federal market. Through implementing Microsoft Dynamics SL, either in the cloud or on-premise, Synergy helps organizations that have outgrown their systems and procedures or identified cumbersome processes, to operate more efficiently while effectively managing projects, resources, time, financials, and growth, and when necessary, in compliance with federal regulations. Synergy’s method of prototyping systems with real company data allows organizations to see how Microsoft Dynamics SL can meet their business needs before they purchase. For more information, visit http://www.synergybusiness.com or call 800-481-8590. Synergy empowers government contractors as described in this white paper "4 Essentials to Becoming a Successful Government Contractor"A white paper entitled, 4 Essentials to Becoming a Successful Government Contractor, describes government compliance Rules, Tools, Controls, and Schools.